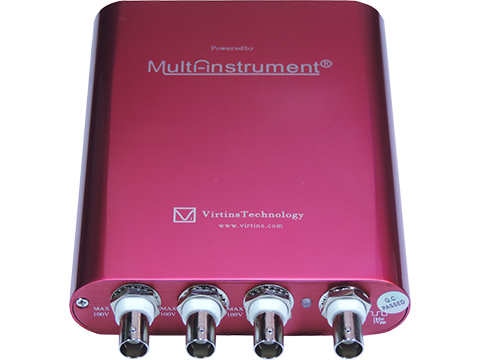 Download and try the fully functional Multi-Instrument software using your sound card as the ADC and DAC device! 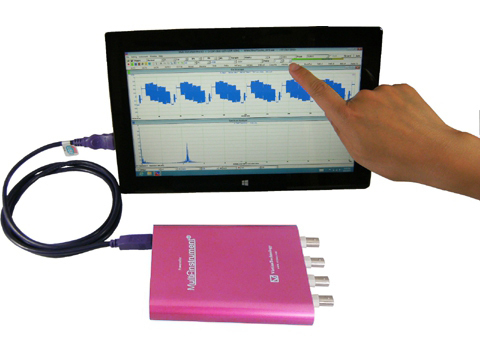 This is one of the second-generation USB DSO (USB Oscilloscopes) designed and developed by Virtins Technology. 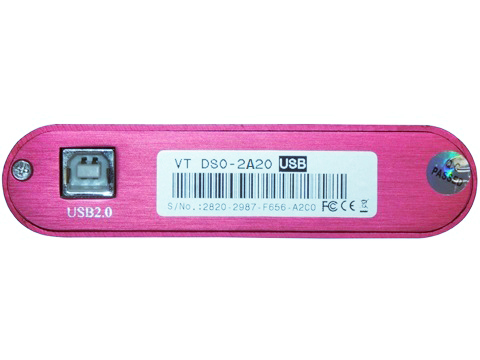 This generation of USB DSOs features Virtins Technology’s unique hardware-based DSP algorithm which enhances the performance and functionality dramatically without adding extra hardware cost. 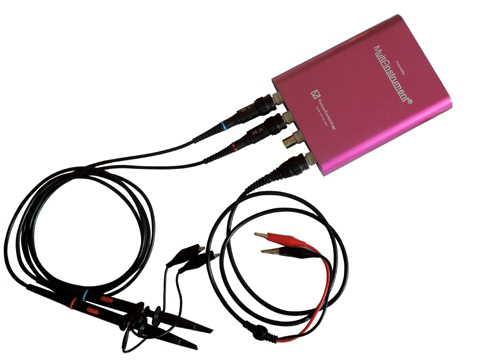 When used in conjunction with Multi-Instrument® software, the USB DSO converts any desktop, laptop, or tablet PC into a powerful oscilloscope, spectrum analyzer, multimeter, data logger, signal generator and so forth, all of which work simultaneously. Equivalent Sampling Frequency = [Real Time Sampling Frequency] × [Number of Frames Persisted]. 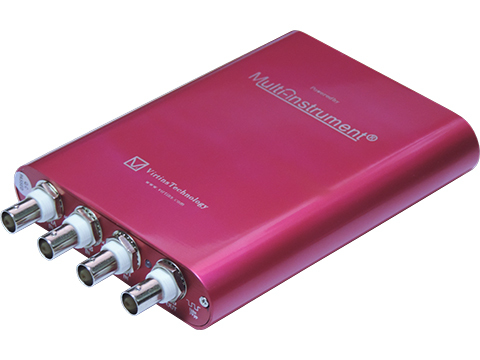 Maximum 40 GHz, for repetitive signals whose maximum frequency is less than ¼ of the real time sampling frequency. Not valid for the case of post-trigger. (Streaming Mode) Limited only by hard disk space available and maximum file size allowed by the operating system. Maximum sampling frequency for continuous streaming is computer speed and software setting dependent and typically 10 MHz (single channel, 8 bit) in Multi-Instrument. 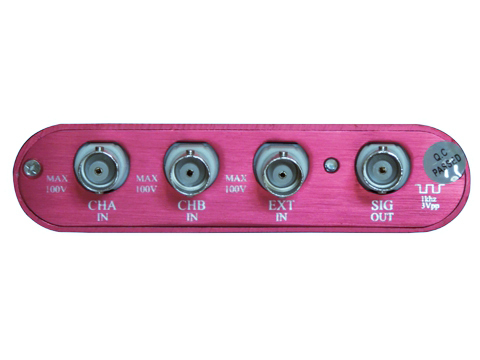 (Streaming Mode for Low Frequency Signals) Limited only by the computer memory available. Roll Mode is allowed when fs ≤ 1MHz and [Record Length]≥ 4 × [Roll Width]. Maximum sampling frequency for continuous streaming is computer speed and software setting dependent. If this option is selected, the effective bit resolution increases from 10 bits to up to 16 bits as the sampling frequency goes down. Zero Calibration Through software. Individually done at factory. Gain Calibration Through software. Individually done at factory. Note: The specified hysteresis may be modified internally to ensure [Trigger Level (%)] – [Hysteresis (%)] ≥ -100% at rising edge, or [Trigger Level (%)] + [Hysteresis (%)] ≤ 100% at falling edge. 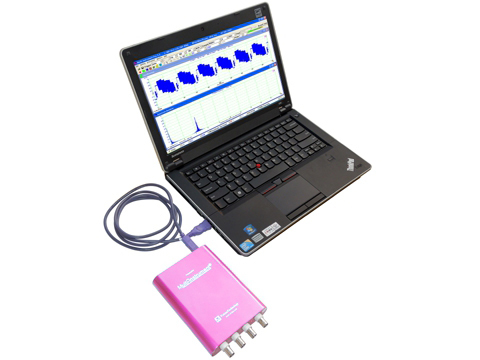 Frequency Sweep DDS Mode Supports linear sweep of all types of repetitive waveforms. Streaming Mode Supports linear and logarithmic sweep of all types of repetitive waveforms. Amplitude Sweep DDS Mode Supports linear sweep of all types of waveforms. Streaming Mode Supports linear and logarithmic sweep of all types of waveforms. *DDS mode consumes almost no computer CPU time while streaming mode consumes a lot. Maximum sampling frequency for continuous streaming is computer speed and software setting dependent and typically 10 MHz in Multi-Instrument. 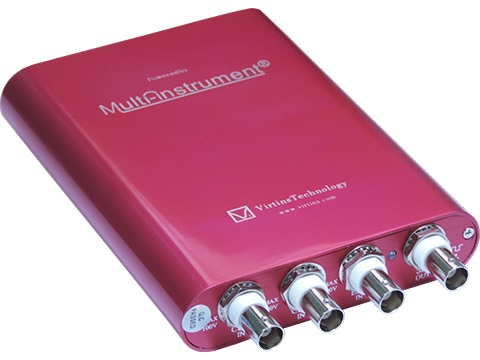 More advanced functions are provided via Multi-Instrument software under streaming mode. 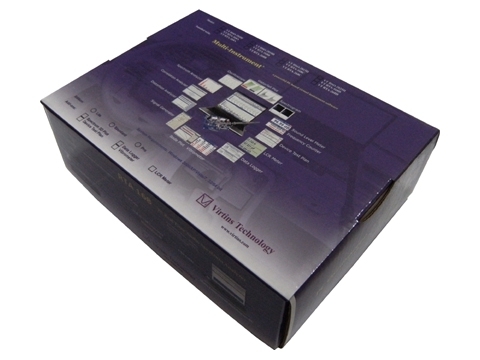 Please refer to Multi-Instrument software manual for details. Power Bus powered by USB port, no external power source required. Accessories include: a 12 cm snap-on rotating ground lead, a sprung hook, two marker rings, a probe compensation adjustment tool, two probe tip caps.